"What a man's got on his mind can't be kept out of his mouth." 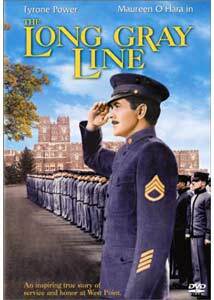 Having recently had some unhappy experiences with movies romanticizing military life, as well as some less than swell John Ford movies, I was rather dreading The Long Gray Line. Even though it is really Ford's love letter to West Point, I found myself irresistibly drawn to the picture and ended up quite liking it in spite of myself. Marty Maher (Tyrone Power) is a new immigrant from Ireland in early 1900s' New York. Taking a job at the U.S. Military Academy at West Point, he ends up breaking so much crockery that he's in the hole before long. Instead, he enlists and becomes a sports instructor at West Point. Meeting and marrying Mary O'Donnell (Maureen O'Hara), Marty and his family become beloved at the school. The movie covers over fifty years of the joys and heartbreaks of Maher's life at the Academy, where he became one of the most beloved instructors at the institution. The story is cannily told in flashback form; the aged Marty is seeking to avoid forced retirement by taking the matter to one of his former students, President Eisenhower. This sets up an immediate sympathy for Maher, who would otherwise be a little brash and grating if we first met him as a hot-tempered young Irish lad. The story moves along at a brisk clip from event to event, with a series of evocative threads simultaneously following some of Maher's first students and their lives and deaths in two World Wars, as well as their descendants. Power admirably conveys Maher's personality in its many facets through a thick stage Irish brogue. Maureen O'Hara is adorable as his initially silent love interest and wife. Several excellent character actors help round out the supporting cast, most notably the sadly forgotten Donald Crisp, who plays Marty's irascible father, and Ward Bond as Captain Koehler, Master of the Sword at West Point. A very young Peter Graves makes an appearance as one of the cadets. This was a very early Cinemascope movie, and Ford immediately took to the wider canvas. Many scenes utilize the full width of the screen, such as the dining halls and rows of cadets. More intimate compositions work well also, most notably a beautiful sequence of Power saluting the flag with his wife next to him. There's a goodly amount of Irish blarney and sentimentality laid a bit thick at times here, but in all the picture is quite enjoyable. Despite not being one of the well-known works from Ford's output, it's well worth seeking out. Image Transfer Review: The widescreen side of the disc is anamorphic, but due to being single-layered only a minimal bit rate can be mustered, hovering around 3 Mbps. The picture is thus left lacking for detail to a certain extent. The Technicolor at times looks somewhat washed out, although other segments are bright and brilliant. The source print is highly variable; long segments are completely pristine, while others have so much speckling they look like a snowstorm. The pan-and-scan side is pretty much unwatchable, as it ruins many of Ford's compositions, losing nearly half of the picture and providing for an extremely cramped viewing experience. Audio Transfer Review: The 3.0 audio track is rather incredible. There is zero hiss or noise, everything is crystal clear and musical range is very broad. Certain segments have very good bass levels. When the marching band is playing near the beginning the bass drum was making my furniture shake. This sound is fabulous considering the age of the film. Very well done indeed. Extras Review: A blurry and cropped 1.33:1 trailer is presented (though it shifts to 1.85:1 to fit the titles in), and the chaptering is good. But that's all. The Spanish and Portuguese subtitles promised on the keepcase are nowhere to be found, though Chinese, Korean and Thai are all here. A less-familiar John Ford work makes its way to disc on a barebones disc; rather than providing a horribly butchered pan-and-scan version, Columbia would have done much better to make this a widescreen-only RSDL DVD. The sound mix is surprisingly effective for a movie nearly fifty-years-old. Definitely worth a look for fans of classic film. Spanish and Portuguese speakers, be warned: no subtitles in those languages are included, though they're promised on the keepcase.